Coming Soon! We are building a brand new kitchen that make our culinary classes even better! Feel free to contact us about traveling to teach a small group, party, after school program, or day care center. Preschoolers can cook too! This class is designed for children ages 3-5 years old. *This class will specialize in using real ingredients and foods. 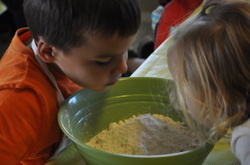 Preschoolers will learn the basic fundementals of cooking as well as social skills. They will learn the importance of taking turns, counting, sharing, washing hands, life skills and more! We talk about safety in the kitchen, we cook, we wash dishes, we use teamwork, we sing, we listen stories related to our "recipe," we try different foods, incorporate 5 senses, and most importantly we have FUN! Preschoolers are involved in almost every process and the hands-on learning experience is perfect for this age group. *This class will be using simple, easy to follow recipes. Multi-age group designed for homeschool children. *This class will specialize in using real ingredients and foods and recipes will be Gluten Free. 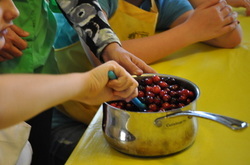 Cooking class incorporates science, math, reading, life skills, and more! Learn how to follow a recipe step by step as well as working with different kitchen and cooking tools. This class is hands-on, fully engaged learning. We try different foods and experiment in the kitchen all while having FUN! In this class students are expected to keep a notebook where we will collect recipes, measurement conversions, cooking tips, and much more. *Bi-Monthly Projects: Every other month or so, students will choose a recipe to make at home and bring to class to share. The recipe can be one we have made in class or the recipe can be new but must use a technique that we have been working on in class. This class is designed for Kindergarten-Fourth Graders who want to learn more about cooking in the kitchen and using kitchen tools and gadgets. 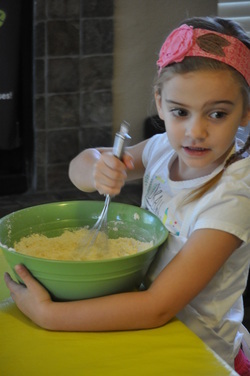 Cooking class incorporates science, math, reading, life skills, and more! Learn how to follow a recipe step by step as well as working with different kitchen and cooking tools. This class is hands-on, fully engaged learning. We try different foods and experiment in the kitchen all while having FUN! Students will make, eat, and take home recipes for all 4 weeks of class.